Kalahari Waterpark Resort and Convention Center in Wisconsin Dells is like going on Safari in the Midwest with comfort and flair. The rooms are beautifully appointed with authentic African-themed décor. 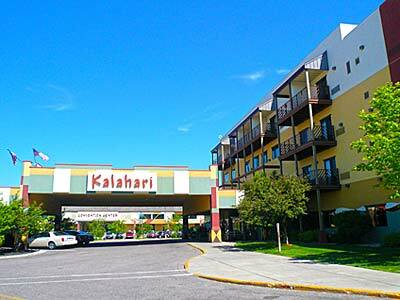 The Kalahari Water Park Resort’s accommodations offer all the comforts of home from Wi-Fi to full kitchens. You will love the full spa and salon facilities, 27 holes of golf (in season) and a newly-added, giant indoor theme park, a favorite fun spot in the Dells. The Kalahari Resort houses Wisconsin’s largest indoor water park and the Resort and Convention Center services small families to large groups with the finest in dining, theme restaurants and night clubs. There really is something for everyone at the Kalahari. All considered, we enjoyed our stay….we stayed in one of the “Kondos” and the wonderful outdoor hot tubs were not working because of a manufacturer’s recall. They claimed they sent 5-6 emails letting me know this…I never got ONE! But I negotiated and got compensation. Then we saw a mouse in the unit and housekeeping called it “your mouse issue”…wasn’t mine, it was the Kalahari’s! Wasps were thick on the deck but not as bad as other years…one would think they would figure out how to fix this issue since we were paying premium rates. But, that said, its clean, very nice, friendly staff and all amenities are within walking distance of the “kondos”…for our family anyway (we’re walkers). We enjoyed our stay and may consider going again but will question a few things first! In our recent visit on July 19 thru 21st–we stay on the first floor in the royal suites section ( 4 adults & 3 grandchildren). The first nite we only had 4 1/2 hours sleep because of the very inconsiderate group above us jumping & making so much noise, We called the front desk the first night 3 times before they finally quieted down (about 3AM.) The next nite same thing till 4:30 am we call 8 times and they send the security — each time they would get noiser-nothing help. the next morning , We complained to the manager and gave us a reduced rate . even he said something should have been done long before 8 calls . We had TOTAL 8 1/2 hours sleep in two nites , my entire family was woken up and even my husband who sleeps thru anything, the kids were at one point crying . we were so tired we left early the next day . first of all They should kick them out after the 3rd warning. and for it to happen again the next night was reidiculous to say the least . We never had that kind of experience before and I hope you change your policy. It’s a great place but, a bit over priced for the theme park and shops. I really enjoyed my stay at The Kalahari. Especially the indoor and outdoor water parks. I would definitely come back again. 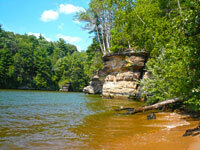 I must say that I was very pleased with my recent visit to Wisconsin Dells. I stayed at the Kalahari Resort, one of the best Wisconsin Dells hotels, and must say I was very impressed. I especially liked its proximity to the movie theater (couple steps away). Five stars all around. Having gone to the Kalahari twice a year for several years my family’s last two visits have left us with less than a pleasant opinion of the Kalahari. We have always stayed on the condo side of the hotel (the Sands) and previously have had amazing service. The last two times we were there the service was horrible, people were rude, and the housekeeping staff barely cleaned our rooms. Not to mention there were fruit flies or knats coming out of our fourth floor condo. The waterpark is great, but because they sell tickets to the public it is overcrowded and takes a while to do any of the rides. Additionally, if you have little ones you are constantly worried they are going to be trampled. I would shop around before coming to the Kalahari, especially during prime season.